Within a matter of months in 2014, people in West Virginia, Virginia and North Carolina were reeling from news of proposals for several massive fracked gas pipelines that would carve more than a thousand miles through the region. The largest is the Atlantic Coast Pipeline, which would stretch 600 miles across all three states, and cost some $5 billion. If built, the pipeline would harm countless family farms, national forest land and historic sites and impair streams and drinking water supplies. Further, it would threaten the health and safety of nearby residents, worsen the impacts of climate change, and impede investments in energy efficiency and renewable energy. 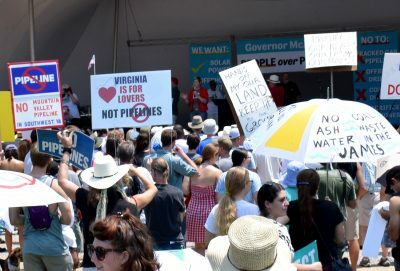 Beginning in the Marcellus shale region of West Virginia, the Atlantic Coast Pipeline would carry fracked gas through five counties there, twelve counties and two cities in Virginia, and eight counties in North Carolina. At 42 inches, or 3-½ feet in diameter, it would be larger than the infamous Keystone XL pipeline, and plow a 125-foot wide construction zone of clear-cutting and excavation, scouring roughly 9,000 acres of land. It would cross roughly 2,700 parcels of private land, many of which have been in families for generations. In the mountains, it would scale dozens of steep mountain ridges in the 2,000 to 4,000 foot range. It would cut through some 30 miles of the Monongahela and George Washington National Forests, as well as bisect the iconic Appalachian Trail and Blue Ridge Parkway. Afterwards, it would require a 50-foot wide strip of permanently cleared land along the entire route. But numerous analyses have shown the pipeline is not needed. 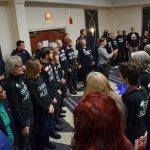 Appalachian Voices is partnering with a diverse and growing coalition of community groups, landowners, forest protectors, faith groups, students, grassroots organizations, conservation groups and others to stop the project. The project lead is Dominion Resources, in partnership with Duke Energy, Piedmont Natural Gas and Southern Company Gas. Despite what analysts warn is a major overbuild of gas infrastructure, the companies are recklessly sticking to their plans and working to build the Atlantic Coast Pipeline as fast as possible. They and their affiliates would also be the main customers for the gas, but this sort of arrangement does nothing to indicate whether there is a public need for the gas. Further, it shifts the financial burden for the project to ratepayers who have no choice but to pay the cost through higher monthly bills but who will see little, if any, of the economic benefits of the pipeline promised by the companies. By comparison, the companies are virtually guaranteed up to 14% return under current policy of the Federal Energy Regulatory Commission (FERC), the permitting authority for interstate pipelines. Moreover, this sort of deal may be illegal. 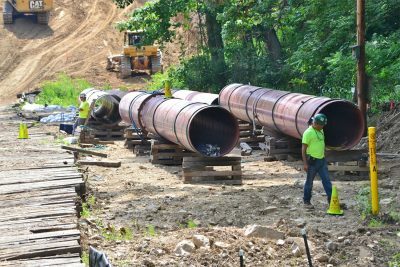 Another study on the pipeline’s economic impacts in Nelson County, Va., where opposition has been particularly strong, shows a one-time cost up to $41 million in lost property value and ecosystem services during construction, and an additional $24.5 million dollars per year in decreased property tax revenue, diminished ecosystem service value and dampened economic growth. Citizens all across the three states are raising concerns about the deep impact the project would have on public lands, natural resources and on the climate. 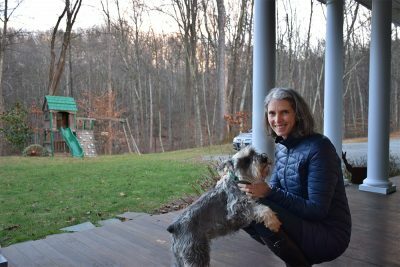 Landowners in the path of the proposed pipeline are especially aggrieved that the companies have argued that, under Va. and W.Va. law, surveyors for the project are allowed to come on their property without their explicit consent. Dozens have taken it upon themselves to fight back legally, and in West Virginia, the Supreme Court ruled in their favor. Of the almost 3,000 people who formally commented on the project to FERC, more than 95% opposed it, according to an independent review. The citizen movement to stop the Atlantic Coast and other pipelines is growing. They also worry the pipelines would threaten drinking water supplies — the route would cross at least 71 miles of karst terrain, characterized by underground drainage systems and sinkholes that could allow pollution to travel far from its source. On a larger scale, they see the pipeline and the increased fracking that goes with it as compounding climate disruption and its wide-ranging impacts. Local groups have sprung up all along the proposed route of the pipeline to raise their voices and defend their family farms, their homes, and their children’s future. Many are part of the 50-member Allegheny-Blue Ridge Alliance, a multi-state coalition that is fighting the Atlantic Coast Pipeline. One local group, Friends of Buckingham County, is particularly concerned about the huge compressor station Dominion wants to build in their county as part of the pipeline project. At almost 53,000 horsepower, the facility would be one of the largest compressor stations, and would operate 24/7, emitting formaldehyde, methane, nitrous oxides and other pollutants. It would be located in the middle of a historic plantation in the heart of a largely African-American community.